Hey ho, let’s go! The Ramones have been one of my longtime favorite bands. I’ve been a punk since my high school years and this band gave me strength to let my misfit flag fly. As one of the originators of the punk movement in the late 1970’s, the Ramones are iconic for their breakneck sound mixed with hints of ‘50s bop to their look of shaggy hair, leather motorcycle jackets, torn jeans and high top black sneakers. I was lucky enough to interview Joey Ramone in 1995, and we kept in touch after, as he emailed me about bands he was excited about until about a year before his passing from cancer in 2001. He’ll always hold a special place in my heart for inspiring the music that got me through my formative years and beyond. 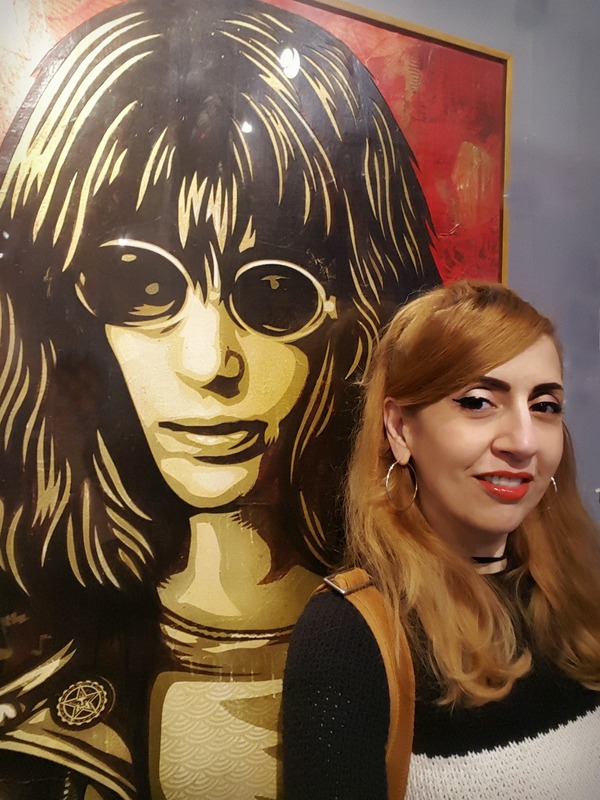 Admittedly, I was late to get to this much-publicized exhibit at the Grammy Museum, put together by Johnny Ramone’s widow Linda with help from fan collections and the estate of Joey Ramone, run by his brother Mickey. But I’m so glad I caught it before it was over. 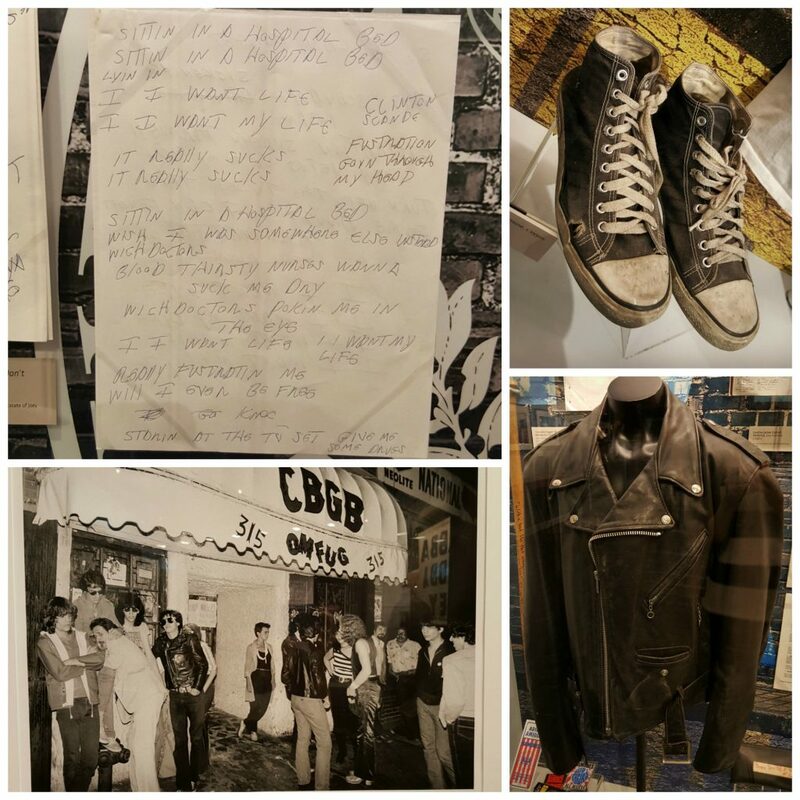 Filled with loads of memorabilia including Joey’s leather jacket and Marky’s iconic black high top sneakers, handwritten lyrics, backstage passes, rare photos and much more. I loved the portraits of each member by artist Shepard Fairey and reading the behind-the-scenes notes on each album on the discography wall. 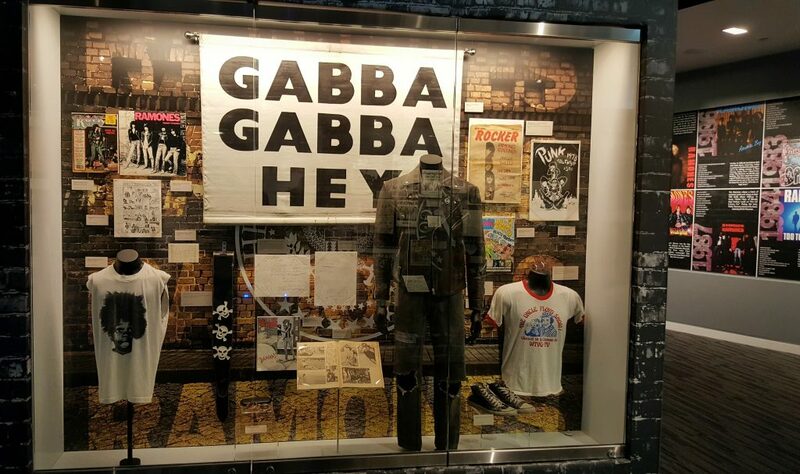 For any Ramones or punk fan, this is exhibit is worth catching in its last week at the Grammy Museum. While punk is about tough leather and all black, which Joey told me, “Hey, we wear all black because it gets dirty walking around New York City!” Punk also had a thing for the dorky coolness of a striped t-shirt, so my striped sweater was in order. (You can’t see but I do have a Ramones t-shirt on underneath!) And what better place to wear some rebel leggings by Christopher Lee Sauve for Ona Saez that I picked up in Buenos Aires (of all places! ), a black mini skirt and some Chelsea boots. 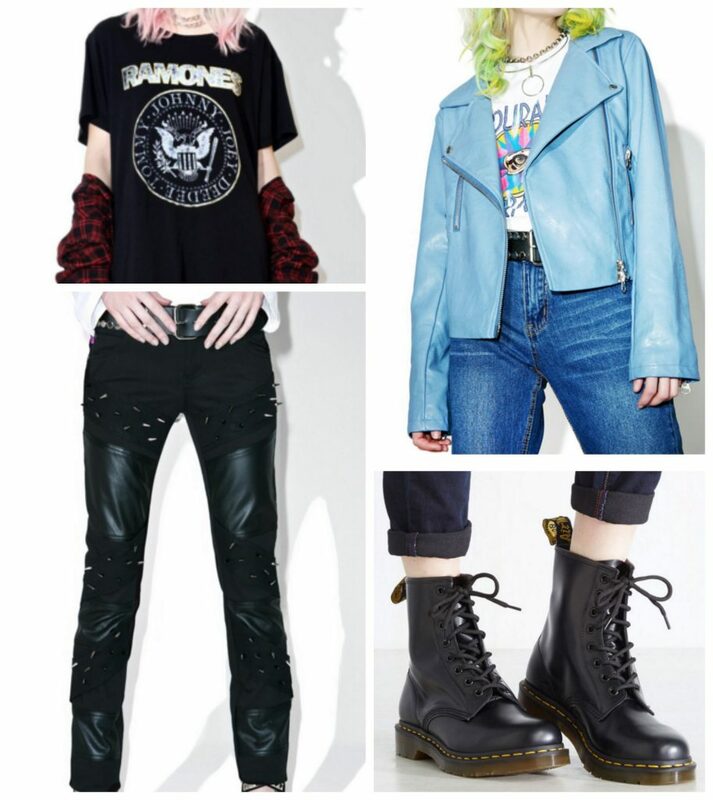 You just gotta have a moto jacket to achieve the punk look but why not give it girly twist in a powder blue color. The requisite Ramones t-shirt also gets an update with some sparkle lettering. And nobody is going to mess with you when you have spikes on your skinny black jeans and classic Dr. Martens combat boots. 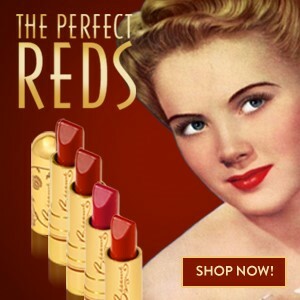 Click the links to shop this look. The Grammy Museum is located at 800 W Olympic Blvd A245, Los Angeles, CA 90015. 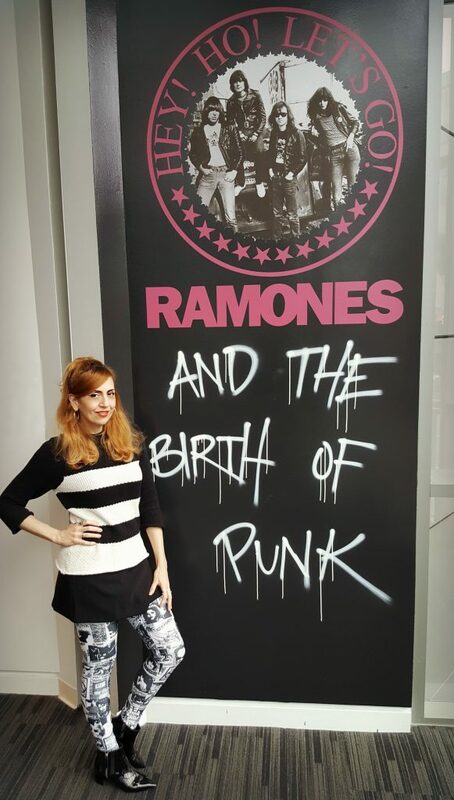 The Ramones and the Birth of Punk runs through February 28.